The shape, decoration and colour of this Iranian dish were all inspired by Chinese celadon ware. Celadon wares made at Longquan in southern China were the most popular type of porcelain imported into the Middle East in the 14th and 15th centuries. The characteristic green glaze of celadon ware can vary in tone and includes the greyish-green shown here. The body of this dish is fritware. Fritware was also known as stone paste or quartz paste. It was developed by Middle Eastern potters as a response to the challenge posed by Chinese porcelain. The main ingredient was fine quartz powder made by grinding sand or pebbles. Small quantities of white clay and a glassy substance known as frit were added. The clay gave plasticity. The frit helped to bind the body after firing. This dish imitates a Chinese celadon of Longquan type. Celadons were particularly prized in the Middle East because they were believed to change colour in contact with poisoned food. 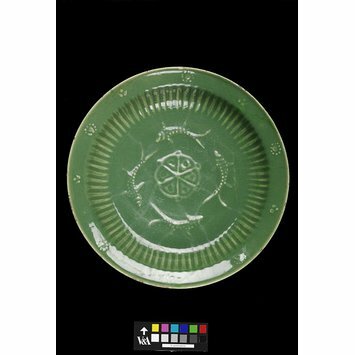 Dish, fritware with moulded relief decoration covered in a green glaze under a white slip, Iran (perhaps Nishapur or Tabriz), 1450-1550. Given by Sir Frank Brangwyn, R.A. The shape, decoration and green colour of this Iranian dish were all inspired by Chinese celadon ware, which has a greyish-green glaze. Celadons made at Longquan in southern China were the most popular type of porcelain imported into the Middle East in the 14th and 15th centuries.